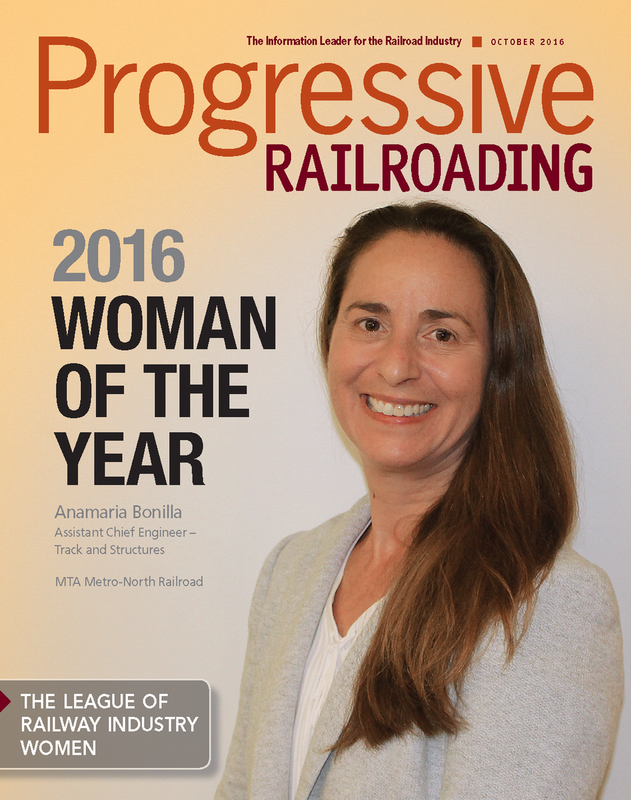 OMAHA, NE, October 3, 2016 – The League of Railway Industry Women (LRIW) named Metro-North Railroad Assistant Chief Engineer Track and Structures Anamaria Bonilla P.E., as the winner of its 2016 Outstanding Woman of the Year award. Bonilla was honored on October 3 at the General Session of the RSI/CMA 2016 Rail Expo & Technical Conference in Omaha, Nebraska. ”The Outstanding Woman of the Year award exemplifies excellence in the rail industry by recognizing a woman who is considered a leader by her peers. This year's receipient, Anamaria Bonilla, does that, and more,” said Jodi Heldt, LRIW President. With over 20 years of experience in highway and railroad engineering, Bonilla has spent the last 12 years working for the Metro-North Railroad (MNR), which operates in New York and Connecticut primarily as a commuter railroad, but with some freight traffic. “Anamaria Bonilla is responsible for the structural integrity, safety and reliability of our infrastructure, which includes over 800 miles of track, 385 overhead bridges, 846 undergrade bridges, 116 passenger stations and thousands of drainage facilities, transmission poles and catenary structures. In addition, she directs inspections and upgrades to the structures that make up the Grand Central Terminal and the Train Shed within Manhattan, arguably the most dense commuter rail operation in the United States. She handles these responsibilities with a calm, disciplined approach worthy of her engineering training and experience,” said Glen E. Hayden, Vice President of Engineering, Metro-North Railroad. In addition to her duties overseeing the engineering group for track and structures, Bonilla is managing the procurement of MNR's first-ever track inspection vehicle, Hayden noted. When it comes to improvements to safety and efficiency on the railroad, Bonilla is ready for the challenge. Where others would do their best to meet federal and safety concerns, she has worked to find innovative and creative design solutions that not only met the regulation, but also improved the railway. Bonilla's insightful approach has made her a well-respected leader in her field among all who know and work with her. A professional engineer in New York and Connecticut, she shares her insight and experience by actively participating on two American Railway Engineering and Maintenance-of-Way (AREMA) committees – Steel Structures and Economics of Railway Engineering and Operations. “Metro-North has been making a tremendous effort to improve our infrastructure and customer service. I am very happy to be a part of that effort. The right leadership is key to a progressive organization. Past LRIW Outstanding Woman of the Year winners have included GO Transit's Mary Proc, Alaska Railroad Corp.'s Wendy Lindskoog, and Norfolk Southern Corp.'s Deb Butler. A call for nominations for the 2017 LRIW Outstanding Woman of the Year award will open in the spring of 2017. For further information: Media Contact: Emilia Marceta, LRIW Chair, Public Relations & Outreach, Phone: 416-526-0156; E-Mail:info@railwaywomen.org; Awards Contact: Sally Boven, LRIW Awards Chair, E-Mail: awards@railwaywomen.org. Want to find out more about our winner? You can read more about her in the October 31, 2016 issue of Progressive Railroading.